While waiting for a train, I noticed this infographic poster that shows in an easy to understand way which trains are busier than others. I found it of interest how just getting a train 10 minutes earlier could make the difference between getting a seat and not getting a seat. Thus the design of the poster helps influence behaviour and hopefully makes journeys more pleasant. The only thing to consider is how quickly the information becomes outdated. In order to succeed in it’s aim, people will need to change their behaviour, thus making the poster’s information unreliable. Perhaps the information could be presented as a screen that could be updated at regular intervals. Or perhaps train seats will incorporate pressure sensors that record when they are occupied making it possible to have data in real time of how busy the next train is and which carriages have the most spare seats for boarding passengers. 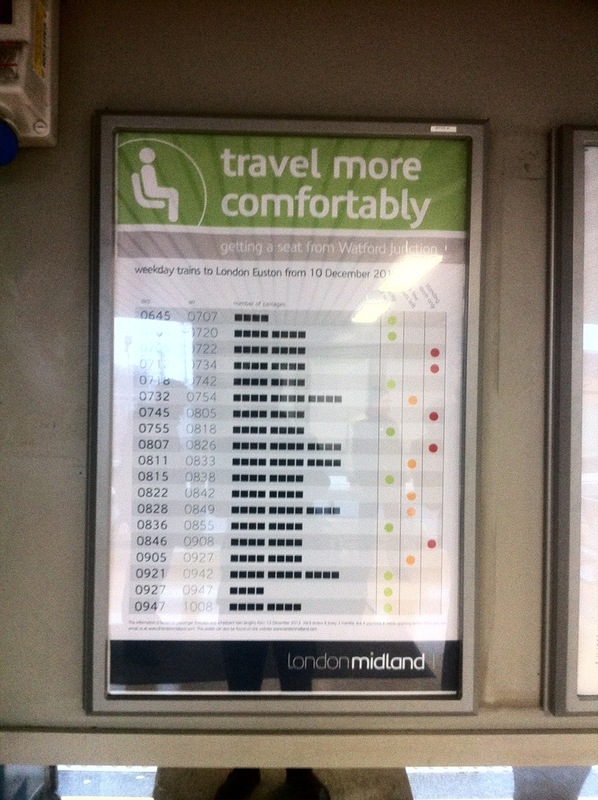 Equally one could criticise London Midland for being aware that a train is overcrowded yet not provide extra carriages!